Just the word “periodization” sounds kind of intimidating. It’s basic definition refers to breaking time into specific or named blocks. It has been adapted into the field of exercise science and physiology as a means to maximize training results, usually aimed at improving performance for competitive events. I’m going to try to simplify it for you. Periodization basically means that you look at the calendar and break it into segments. For myself, I break the calendar into three-month blocks or phases. If you have an event coming up, you can use that as a starting point to build your time blocks around and work backwards to develop your plan. It is very common for people doing a triathlon to use periodization planning to not only prepare, but also to make sure they don’t overdo it. It helps to reduce injury and improve performance. 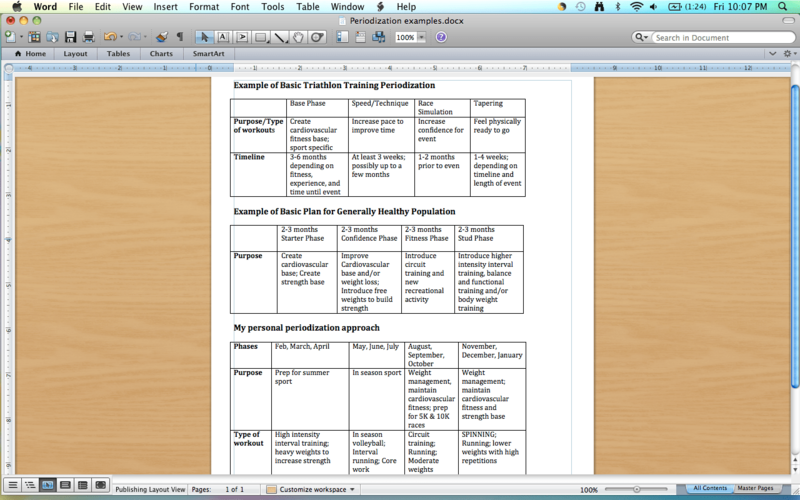 I personally use periodization even when I am not prepping for an event. I usually develop an exercise plan and schedule that lasts about 12 weeks and is geared for a specific purpose. I change it up every three months because I know that the theory of overload is always looming. In other words, if we continue to do the same activities over a period of time, it no longer serves as an overload to our body. If we aren’t overloading or challenging our body, we won’t see results. The purpose and length of time that each phase lasts is going to be depending on your clientele and what you are trying to achieve. If you are working with someone in a cardiac rehabilitation or physical therapy setting, this is going to be very different from working with an otherwise healthy adult who is looking to lose weight. Regardless of the setting, periodization is as much for the general population as it is for someone who is a competitive athlete. I am amazed when I find out that someone who is new to exercise or trying to achieve weight loss goals is still doing the exact same routine after 6 months and seem to be perplexed about when they aren’t seeing results. They need to change things up! Isn’t there a quote that insanity is doing the same thing over and over and expecting different results? Our bodies are amazing and they adapt very quickly. So, in short, periodization is just a planned approach to make sure that what we are doing has a purpose, within certain time frames. Not only does it require a well thought-out plan, it also serves as a great means to provide some variety and keep things interesting. Checking in on goal progress and setting new ones can also be done with each phase. I feel like the easiest way to explain this approach is to provide some examples. Click on the screenshot below. These examples are going to be very basic and simple. I hope to revisit this issue in more detail, even breaking each of these examples down in more detail to provide specific workout plans to further illustrate even more detail that you can go into when periodizing.